There is no doubt that in these times the molecular engineering, electronic devices and technological advances are increasingly at the service of improving the health of the population, with special interest in Diabetes. Diabetes is considered the largest epidemic in the history of mankind with the devastating consequences that entails its poor control and the high costs that this represents for all countries around the world. 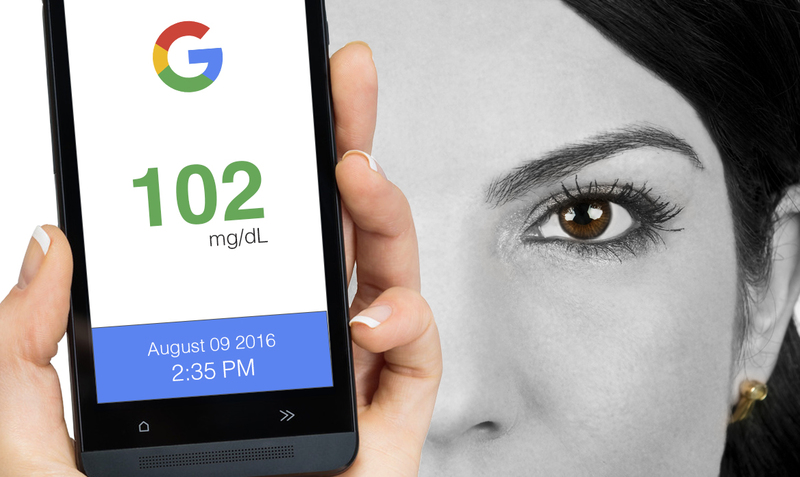 So Google could not be left behind and is preparing to launch a digital contact lens that will measure glucose levels in an immediate, continuous and painless way. This extraordinary continuous monitoring system also will store and display the results through an intelligent device. These contact lenses are the first product developed by the newly created division of Google, “New Life Sciences”, whose main priority is to develop new technologies that help people with diabetes to maintain optimal control of their blood glucose levels and Hemoglobin A1c in a more secure, discreet, comfortably and efficiently manner. To put their bit in the fight against Diabetes and irreversible damage it causes when it is not properly controlled, in turn causing much suffering and enormous costs to health systems in all countries of the world, the American company Google is developing a digital contact lens that measure glucose levels continuously and without pain, which will send them to a smart receiver that will store and display all the results obtained with each blink of the eye, allowing in this way to people with diabetes achieve good control of their glucose levels in a more secure, convenient, discreet and effective way. This special contact lens, which undoubtedly will revolutionize the control of diabetes, has an intelligent receiver, that, in addition to interpret and display the results, will also have alarms that alert you if glucose levels are falling or rising too suddenly, thus helping prevent hypoglycemia (low blood glucose) or hyperglycemia (elevated glucose levels). But how this revolutionary digital contact lens work? This glucose levels continuously monitoring system consist in three elements. The contact lens, which is the first element, will detect glucose levels through tears that permanently keep our eyes moist. The second element is the reader, that will receive the results issued by the digital contact lenses and the third element will receive, interpret and display the results, which are then stored in a database. The reader can be a clothing accessory or jewelry as a hat, a chain or a tendril. The important thing here is that the reader is close to the eye to get a better transmission between contact lenses and reader. The receiver can be a smart phone or a mini computerized device. One possibility could be that the reader and the receiver are integrated into a single device, such as the Google Glass which is another project of the “New Life Sciences” division of Google. Google digital contact lenses will be the same size and made of the same materials as conventional contact lenses, and although these digital lenses have a glucose sensor within them, will be equally comfortable as any other contact lenses. This is the first product of many that Google has planned to develop to help people with diabetes through its newly released “New Life Sciences” division designed specifically to meet this objective and which operates under the Alphabetical INC company, which is a subsidiary company of Google. Alphabetical INC is developing this extraordinary device for good control of Diabetes, in partnership with Alcon, a subsidiary of Swiss giant pharmaceutical Novartis Company. “New Life Sciences”, the division of Google, which is led by Andy Conrad, molecular biologist, has secured strategic partnerships with Novartis and Dexcom and is negotiating with other leading pharmaceutical companies in the area of diabetes for new partnerships that allow them develop other innovative projects and products that definitely look to revolutionize good control and treatment of this serious health problem that already affects about 400 million people worldwide. Projections indicate that the incidence of diabetes worldwide will double in just 20 years, and in the United States, the situation will be even worse, since these projections indicate that the number of people with diabetes will double in just 10 years. So it is very important that large technology corporations, companies in the pharmaceutical, food and hospitality industry, plus all Diabetes organizations, media and the general public join forces to minimize this serious public health problem. In Diabetes Up To Date we are pleased that the largest and most powerful technology worldwide companies such as Google, are joining the fight against Diabetes and contribute so that together we can face it and overcome it, and thus all people with Diabetes can enjoy a healthier, productive and happy life. Source: Farr C. “Why Google Is Going all in on Diabetes” National Public Radio.